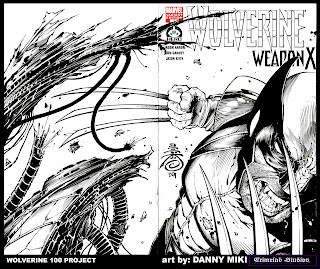 Dangerous Danny Miki, straight outta the 909, has ponied up his Hero Initiative Wolverine cover, and even showed us a bit behind the curtain with his handsome photo ref, and work-in-progress pencils. Click the pic for a WAY lerger version. Final version below, and it's a beaut! Danny is one of the sickest inkers around, and such a cool guy, too. This is great!